“Saint George and the Dragon,” a 14th-century Russian icon. 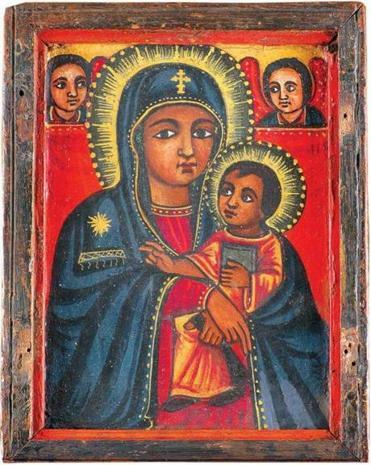 “Mother of God,” a 17th-century Ethiopian icon. CLINTON — Its collection of more than 1,000 Russian icons and artifacts has earned the Museum of Russian Icons, improbably sited in this small Central Massachusetts town, an outsized reputation. Spanning six centuries, the compendium is the largest of its kind in North America, and one of the largest private collections outside Russia. This year the museum hosts two special exhibitions guaranteed to further enhance its stature. Through April 18, visitors can view an exhibition of icons and artifacts representing the Christian tradition of the East African nation of Ethiopia. On loan from a private German collection, “The Vibrant Art and Storied History of Ethiopian Icons” includes 60 icons, triptychs, and illuminated manuscripts, dating from the 16th century to the present. Ethiopian iconography is distinguished by vivid colors and stylized, graphically bold figures with large, almond-shaped eyes. On May 2, the museum will debut “Byzantium to Russia: The Origins and Development of Russian Icons 1200 to 1900,” with 48 icons and artifacts from the British Museum in London. 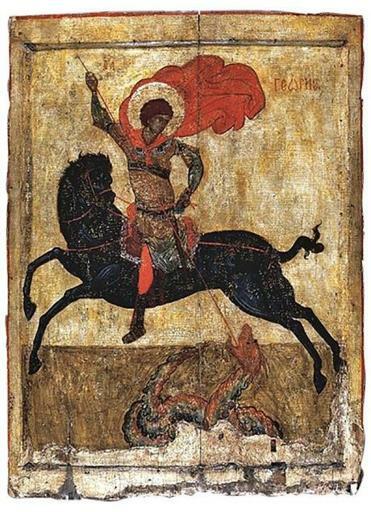 Two of them, Saint John the Baptist (Constantinople circa 1300) and Saint George and the Dragon (also known as “Black Saint George,” Pskov, late 14th century, and pictured above), have never been shown outside the British Museum. This special exhibition traces the development of sacred art from ancient Byzantium (modern-day Istanbul), the center of Christian civilization, to the introduction of Christianity to Russia. MUSEUM OF RUSSIAN ICONS 203 Union St., Clinton. Tue-Fri 11 a.m.-3 p.m. (Thu till 7), Sat 9 a.m.-3 p.m. Adults $10, ages 59 and older $7, students and children $5, under 3 free. 978-598-5000, www.museumofrussianicons.org.